This article was originally published in Parrot Society magazine volume 50, October 2016. Written by PSUK member Emma Freeman, from South Wales. Emma worked in parrot rescue for 10 years, and was area representative for the South and West Wales region of the Parrot Society. it gives useful information about the longevity of parrots, and providing for their long-term needs. Something we are often guilty of when choosing a parrot as a companion is not considering how long lived they can be. I know cockatoos in their 40s and 50s, an Amazon who was 73 when she died and a Macaw who is well into his 80s. 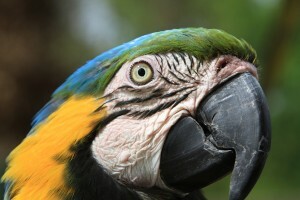 Parrots can live far longer than other pets. Even if we are aware of this fact, we often don’t think about how our own circumstances can change during their life span. We all take on parrots with good intentions of giving them a ‘forever home’ but in reality ‘forever homes’ rarely exist. With the best will in the world we can’t foresee the future and many of us will, at some point, have to find a new home for a beloved parrot companion. There are many reasons why parrots are re-homed, probably the most common is that the owner was unprepared for what life with a companion parrot entails. Anyone with long term experience of parrot keeping will agree that parrots can be demanding companions that need specialist care to keep them healthy in body and mind. Parrots have natural traits which don’t necessarily marry with our lifestyles - they are naturally noisy, destructive, messy, and curious to a fault, traits which may serve them well in the wild but can be very hard to live with in your home. Add into the mix their need to bond with their human companions and the inevitable hormonal behaviour and it can often prove to be a recipe for disaster. 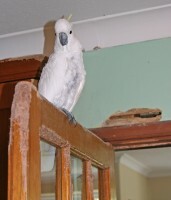 Cockatoo gradually destroying its owner's kitchen! Their intelligence may play a part in them not proving to be the ideal companion for many people, as we often underestimate just how clever and perceptive they can be. Don’t let the size of their heads fool you into thinking that they are pea brains, far from it, even the smallest parrots are smart little cookies. They are adept at training us to their every whim and not above throwing parrot tantrums when they can’t have their own way. Re-training them to behave differently is difficult but not impossible, however many people don’t know how to do this and don’t know who to turn to for advice. Living permanently with the equivalent of a naughty toddler is not for everyone, especially when you can’t just grit your teeth and think that this is a phase they’ll grow out of. Being clever also means that they get bored easily, parrots need to be stimulated. In the wild all their energy would be used for foraging, keeping safe, nesting and raising young. In our homes their needs are taken care of, resulting in their waking hours being used for recreation, they want to investigate, play and interact with their flock. They are naturally active, alert and curious and need to be stimulated to keep healthy, if not, then our parrots experience boredom which is a very unnatural state for them and leads to many problems psychologically and physically. Keeping them occupied is time consuming and needs some creative effort, more than some owners are prepared to give. Life with a companion parrot is an ongoing working relationship and I emphasise the word ‘working’ as it involves effort, commitment and bucket loads of patience. This level of effort and commitment is not easy to sustain over a long period of time and as parrots can live to a similar lifespan as our own, it can prove to be a very long term commitment. And that is the main problem, because long term commitment is something that many of us can’t make to our parrots. Our own lives can change in so many ways during our pets’ lifetime, sometimes we are unable to continue to care for them. These changes can be the breakdown of a marriage or relationship, change in a job or working hours, having to care for a family member, illness and bereavement, or any number of other circumstances which mean our lives change drastically and our pets can’t be our number one priority any more. How we deal with these changes is of paramount importance to our parrot’s wellbeing. It is not fair to keep a bird when you can no longer give it the time and attention it needs, just because you can’t bear to part with it. Delaying the decision to re-home your parrot will not help in the long run, leaving them for long periods of time without the care and attention they need will lead to future problems and possibly make it harder for them in their new home. Nothing can prepare you for the disappointment and the crushing guilt you will feel but if you can no longer give your bird what it needs to be happy, then it is the kindest option to look for a new home. In certain circumstances, it might be possible for you to find someone who would be willing to take in your bird temporarily. Depending on the reason for you being unable to care for your parrot, if say you had to work abroad or you were recovering from an illness, something which was temporary, then this could be a solution worth considering. 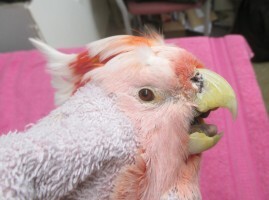 There are a number of different options you can pursue if however you do decide to re-home your parrot. Sometimes a friend or family member will be willing to take your parrot, this is ideal as your bird will already know them, and the friend or family member will be familiar with your parrots likes and dislikes and general routine. If this is not possible, then the Parrot Society may be able to help you. You can advertise for a new home for your parrot in the monthly magazine, the benefits from this are that the members reading the Parrot Society magazine will have previous experience with parrots and will understand the needs of your bird. Alternatively, you may wish to look at parrot rescue/refuges in your area but make sure you do your research beforehand and feel happy about the way the charity is run. Don’t hand your bird over to any organisation if you feel uncomfortable about anything, or are unsure of the outcome for your parrot. Some people consider selling their bird as an option but I would say to proceed with extreme caution, once money has been exchanged you will no longer have any say of what happens to your parrot in the future. No matter how you decide to find a new home for your parrot, it will help immensely to write down a detailed list of your bird’s history. Things like - their age, medical history, food they regularly eat, likes and dislikes, whether you cover them at night, favourite types of toy and general routine. This information will help the new owner and make the transition to a new home much smoother for your parrot. If it’s possible, it also helps to give the new owner your parrot’s usual cage and toys, then there will be some familiarity for them in their new surroundings. Re-homing a parrot will be a difficult decision for anyone, but life is never straight forward and due to the longevity of our parrots, none of us can foresee the changes that can happen in our own lives during their lifespan. Feel sad by all means, that is a natural reaction, but don’t let guilt take over, if you have put the needs of your parrot before your own feelings, then you will have done the right thing. Not many of us have, or would want a ‘forever home’, we experience any number of changes in our lives, helping us to learn and grow. If our parrots live a similar lifespan to us then is it realistic to expect them to have just one ‘forever home’?